Chelsea R. Chapman is a native San Diegan, proud of her Asian heritage and committed to applying her Public Health and Communication research to bettering her community. She earned her B.A. and M.A. in Communication at San Diego State University. 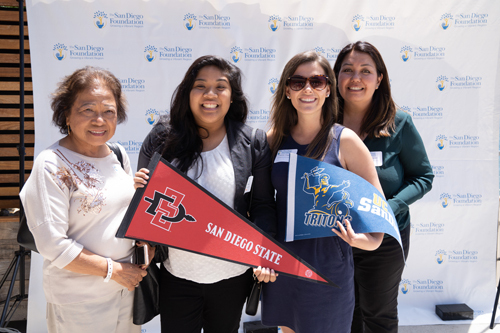 She is currently earning her PhD in Public Health through a joint doctoral program between San Diego State University and University of California, San Diego. Her journey as a scholar and contributor to her community began 10 years ago, when Chelsea was a Sophomore in High School. She was faced with the task of completing a Girl Scout Gold Award, a great honor and responsibility. This was her opportunity to have a lasting impact on her community and help those who needed it most. She spent months researching who deserved service and how she could help them. After a long search, she began to volunteer at the Veterans Home of Chula Vista committed to helping the disabled and elderly who had given their best years to defending our country. Many of these residents struggled with Alzheimer’s disease, Parkinson’s disease, and dementia. Chelsea spent 2 years developing and implementing a Sensory Stimulation Rehabilitation Program to bolster these veterans’ memories and improve their quality of life. Since that project, she has guided her life by two principles: to maintain a curiosity for knowledge and to help those around her. During Chelsea’s undergraduate degree, she continued to work with military veterans, researching the socio-behavioral factors that prevent military men and women from discussing important medical symptoms with doctors, family, and friends. Chelsea has also branched out beyond the military community and pain communication research. She was involved in an international health communication project about patient safety in hospitals which culminated in a textbook used in several European medical schools. She has also aided a professor and film crew in creating a documentary about a cancer journey which followed a woman diagnosed with breast cancer, her family, and her medical team from diagnosis through breast reconstruction. The documentary is in its final editing stages and is set to air in 2019. Chelsea’s graduate studies were focused around how cancer patients and their oncologists communicated about pain through treatment. Her Master’s thesis unveiled how patients with cancer and doctors negotiate pain intensity and life impact. In her PhD program, Chelsea works in the Applied Sensorimotor Lab at SDSU. The current study she is involved with consists of determining how physical activity and sleep quality impact pain tolerance in adults in the San Diego community with chronic spine pain. One great benefit of this research is that participants are given access to their own sleep and activity data, increasing their awareness of the dangers of their own sedentary behavior. Chelsea enjoys working with community populations and hopes to work closely with the underserved patients at Family Health Centers of San Diego for her doctoral dissertation. Chelsea’s journey has been supported by mentors and community leaders who continue to shape her values and provide her with opportunities. Most recently, Dr. Ofelia Dirige of Kalusugan & Kalakasan Center for Health and Wellness awarded her the Riz Oades Memorial Scholarship in support of her Public Health studies. Chelsea is excited to be supported by such an incredible organization and to see what opportunities to serve her community will present themselves.